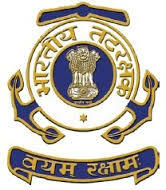 Applications are invited from male Indian nationals for recruitment of of Navik (General Duty) in the Indian Coast Guard, an Armed Force of the Union. The closing date for submission of online applications is 29th January 2016. Minimum 18 Years and maximum 22 years (i.e. between 01 Aug 1994 to31 Jul 1998) (Upper age relaxation of 5 years for SC/ST and 3 years for OBC candidates). Educational Qualification: 10+2 passed with 50% marks aggregate in total and minimum 50% in each subject of Maths and Physics from an education board recognized by Central / State Government. (b) The qualifying cut off percentage of a particular Centre may be increased if more number of applications with higher percentage is received. (1) 1.6 Km run to be completed in 7 minutes. (2) 20 Squat ups (Uthak Baithak). (3) 10 Pushup. Candidates undergoing PFT will do so at their own risk. (g) Based on the performance in the written examination, candidates will be shortlisted for medical examination in a ratio as may be decided by the Indian Coast Guard.Mere declaration of fit in initial medical examination does not indicate selection of the candidate for the final medical at INS Chilka. (h) The select list will be prepared from the candidates who qualify in all the tests depending upon the available vacancies. The Zone wise select list of candidates will be displayed in the Indian Coast Guard Website www.joinindiancoastguard.gov.in in the month of Jul 2016. It is clarified that merit list will be zone wise and not centre wise. The Recruitment Zones: Northern Zone, North-East Zone, East Zone, West Zone, North west Zone and A&N Zone. (a) Height - Minimum height 157 cms. Reduction in height for candidates from hilly and tribal areas will be in accordance with the Central Govt. orders. (b) Chest - Should be well proportioned.Minimum expansion 5 cms. (c) Weight - Proportionate to height and age +10% acceptable. (e) Medical examination will be conducted by authorized Military Doctors as per medical standard prescribed in current regulations applicable to Enrolled Personnel on entry. How to Apply: Eligible Candidates are required to Apply Online from 23/01/2016 to 29/01/2016 till 17:00 Hours. On successful submission of the online application a unique Application / Registration number will be provided to the candidate. Candidates must note down this application number for future reference and for retrieval/ reprint of admit card. Applicants to take print out of the admit card through Join Indian Coast Guard Website from 10/02/2016 to 19/02/2016 only post short listing of the online application.